There is urgent need for effective and durable rehabilitation solutions for deteriorated highway bridge decks. Deck deterioration is commonly caused by a combination of vehicle loading, freeze–thaw degradation, cracking, delamination of cover concrete, and/or corrosion of internal reinforcement. Deteriorated bridge decks are commonly rehabilitated using overlays depending on the cause of deck deterioration, available budget, and desired service life of the rehabilitated structure. Common overlay materials include conventional concrete, high-performance concretes (HPCs), latex-modified concretes (LMCs), asphalt with waterproofing membranes, and polymer-based materials. The performance objectives of bridge deck overlays include protecting the underlying deck and reinforcement from contaminates, providing additional strength and stiffness to the deck system, and extending the service life of the overall structure. The primary difference between typical UHPC formulations and UHPCs that have been specially formulated for overlay applications are the rheological properties. Most UHPCs are formulated to flow under the force of gravity and be self-consolidating. UHPCs formulated for overlay applications are typically thixotropic. Thixotropy is a time-dependent shear thinning property of a non-Newtonian fluid, which causes a material to remain solid-like under static conditions and to flow when agitated or sheared. Bridge decks are not level. If a typical (nonthixotropic) UHPC were to be used as a bridge deck overlay, it would flow from the crown, or high side, of the super elevation to lower points on the structure. This would likely cause difficulty with screeding and profiling. UHPC has a very low permeability and very good resistance to freeze–thaw damage. 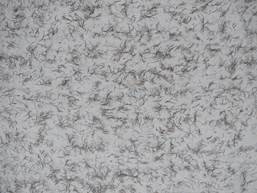 Thus, the potential for ingress of contaminates and freeze–thaw damage is significantly reduced compared with conventional overlay materials, which enhances durability. UHPC has good abrasion resistance, which means reduced potential for rutting. Compared with conventional concretes, a well-designed UHPC mix will exhibit relatively low shrinkage, thus reducing the potential for shrinkage-induced cracking. 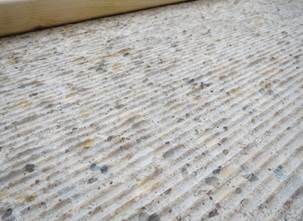 If the UHPC does crack, crack widths are typically significantly smaller than those that would form in a conventional concrete system because of the UHPC’s internal microfiber reinforcement. Table 1. Approximate cost of different overlay solutions compared with bridge deck replacement. *Data collected from Krauss et al. (2009). (5) The costs shown reflect average values from low and high ranges. **Data collected from Br✓hwiler et al. (2015). (7) Price reflects cost of material and installation. †Price reflects material cost only, assumes UHPC cost of $1,000 per cubic yard. ‡Price reflects material cost only, assumes UHPC cost of $3,000 per cubic yard. It is critical that bonded overlays achieve and maintain good bond with existing bridge deck concrete. A study was carried out at the Federal Highway Administration’s (FHWA) Turner-Fairbank Highway Research Center (TFHRC) to investigate the bond behavior between UHPC and existing concrete. The UHPC tested was specially formulated for bridge overlays and had thixotropic properties. The main objective of this research was to compare the tension bond strength of a UHPC overlay to that of a commonly used overlay material, LMC. Tests were conducted on different substrate materials using different substrate surface preparation methods. The bond strength was assessed according to ASTM C1583, which is the direct tension bond pull-off test. (8) A schematic of this test is shown in figure 1. Specimens were prepared by gluing a 2-inch (51-mm) diameter steel pull-off disc to the overlay material, which was roughened prior to disc installation to promote bonding at the desired test location. Once the adhesive layer cured, a partial core was drilled through the overlay material and into the substrate material. This created a load path directly through the interface between the two materials. A specialized pull-off test fixture was then used to apply load and record data. Tensile load was applied to the steel disc at a constant rate of 5 ± 2 psi/sec (34.5 ± 13.8 kPa/s) until failure. The failure load and the failure mode were recorded upon completion of the test. Figure 1. Illustration. Direct tension pull-off bond test based on ASTM C1583. Bonded overlays, in most cases, are placed atop existing reinforced concrete decks or, in some cases, may be placed atop an existing, failing overlay. Regardless of the substrate type, the substrate is usually roughened prior to overlay installation to promote bonding; in some cases, additional bonding agents may be used as well. There are a variety of commercially available tools currently employed to mechanically roughen the deck substrate prior to overlay installation. (9) Two of these technologies were selected for the research presented herein: scarification and hydrodemolition. Scarification is achieved by the rotatory action of cutters (toothed washers) on the surface to fracture or pulverize the material. Scarified or removal depths may range from 1/4 inch (6 mm) to 3/4 inch (19 mm). In this study, scarification was achieved using a small-scaler walk-behind scarifier to remove approximately 3/8 inch (9.5 mm) of substrate material. Figure 2 shows a picture of the concrete substrate base slab after scarification. 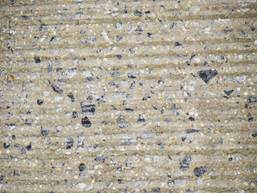 A series of grooves can be observed along with some of the concrete’s internal coarse aggregate. Hydrodemolition uses high-pressure (up to 45,000 psi (310 MPa)) water jetting to remove material from the substrate in a controlled manner. In this case, a pressure of 15,000 psi (103 MPa) was used to remove 1/2 inch (12.7 mm) of the substrate material. Figure 3 shows a photo of the post-hydrodemolition concrete substrate base slab used in this study. UHPC has become increasingly popular for connections between prefabricated concrete bridge deck elements. Thus, there may arise a case where a UHPC (or conventional concrete- or asphalt-based) overlay may be placed atop an existing UHPC connection. Therefore, it would be equally critical that the overlay bond to the UHPC used in the connection. As such, a second base slab was produced using a commercially available UHPC-class material commonly deployed in prefabricated concrete bridge deck connections. One of the UHPC base slabs was prepared using scarification to remove approximately 3/8 inch (9.5 mm) of substrate material (shown in figure 4), and the other one was prepared using hydrodemolition with a pressure of 40,000 psi (276 MPa) to remove 1/2 inch (12.7 mm) of the substrate material (shown in figure 5). As previously noted, two overlay materials were used: a proprietary UHPC mixture specially formulated for bridge deck overlays and an LMC overlay. The LMC was designed in the lab, with a 28-d compressive strength of 5,000 psi (34.5 MPa), 6-inch (152 mm) slump, and 30 percent latex (by mass of cement content). This mix design was similar to that deployed on several bridges in the State of Virginia. (10) Both overlay materials were placed with the assistance of a handheld trowel with motorized vibration. Table 2 summarizes the parameters considered in this preliminary lab testing phase. Table 2. Laboratory test matrix. 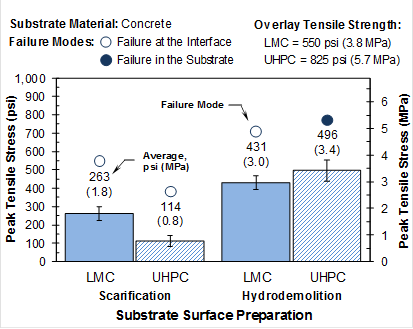 Figure 6 and figure 7 present the peak tensile stresses at failure of the overlay materials over the concrete and UHPC slab substrates, respectively. 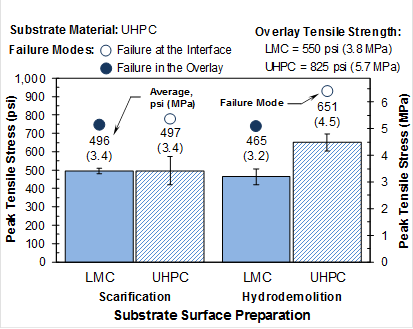 In general, UHPC overlays exhibit comparable, if not higher, bond strengths than LMC overlays, except for the case where a scarified concrete substrate was used. Another observation is that bond strengths tended to be higher when a UHPC substrate was used, compared to those obtained over a concrete substrate. Finally, the hydrodemolition technique offers the possibility of obtaining higher bond strengths than scarification. This is attributed to the fact that mechanical preparation methods may introduce microcracking on the substrate material, which might eventually affect the bond performance. Figure 6. Peak stresses recorded from direct tension bond testing on a concrete substrate. Figure 7. Peak stresses recorded from direct tension bond testing on a UHPC substrate. The first U.S. deployment of UHPC as a bridge deck overlay was completed in May 2016 on a reinforced concrete slab bridge located in Brandon, Iowa; the bridge is located on Laporte Road. 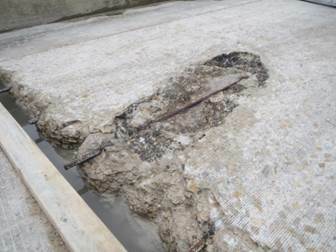 A few months after installing the UHPC overlay, a field inspection revealed some locations along the length of the bridge where delamination may have been present. These locations were identified by sounding the deck using a chain drag. 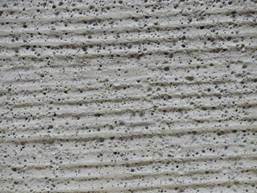 However, it was not known whether delamination, if actually present, was located at the interface between the UHPC overlay and substrate concrete, within the existing concrete deck, or within the UHPC overlay itself. Thus, there was a need to assess the bond between the UHPC overlay and substrate concrete to determine whether locations of potential delamination were a result of poor bond between the UHPC overlay and the concrete deck or a result of preexisting issues. 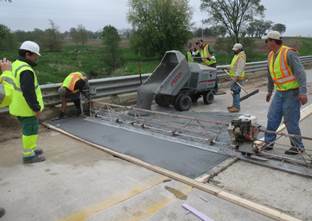 In November 2016, researchers from FHWA TFHRC conducted a field study on the Laporte Road Bridge to evaluate the bond between the UHPC overlay and the substrate concrete bridge deck. (2) The approach included both field-based and laboratory-based investigations. Constructed in 1960s, the Laporte Road Bridge over Mud Creek is a three-span reinforced concrete slab bridge located approximately 35 mi (56.3 km) northwest of Cedar Rapids, Iowa. The bridge was originally designed using H20-44 loading, and although it has a low average daily traffic, it carries large trucks with agricultural loads. The abutment-to-abutment length of the bridge is 100 ft (30.5 m). The width of the bridge is 28 ft (8.53 m), and it services two lanes of traffic. The slab has a uniform thickness of 16.9 inches (430 mm), is reinforced in the longitudinal direction with bars ranging between #6 and #10, and is reinforced with #6 and #7 bars in the transverse direction. The original design drawings specify a 2-inch (51-mm) clear cover between the top mat of steel and the bare ride surface of the concrete deck. The bridge deck has a 5-percent superelevation. The bridge deck was beginning to exhibit delamination and spalling along the curbline nearest the deck drains and at each end at the expansion joints. It is likely that the deterioration was related to chloride laden water ingress into the concrete and past the strip seal expansion joints, leading to reinforcement corrosion and freeze–thaw cycle-related distress. For example, figure 8 shows one of the distressed regions found on the deck after removing a thin layer of cover concrete. This region was selected as a test location. As shown, this deterioration had progressed to the point that maintenance actions were necessary. A UHPC overlay solution was selected to repair the deteriorated deck. This project was considered a demonstration project for UHPC overlays. The UHPC overlay material used was proprietary, and the material supplier provided onsite technical support to the contractor during the installation of the overlay. The overlay was constructed in two stages. The overlay was first installed on the westbound lane (stage I), and subsequently on the eastbound lane (stage II). Prior to installation, the deck surface was prepared with a truck-mounted diamond grinder to promote bonding with the UHPC overlay (shown in figure 9). The diamond ground concrete deck was pre-wetted a few hours before placement of the overlay. The UHPC overlay was mixed onsite and placed using motorized buggies and hand tools (shown in figure 10). Once completed, the overlay surface was coated with a wax-based curing compound and covered with plastic sheeting to prevent dehydration. The evaluation methodology included synthesis of photographic evidence, a field inspection of the bridge deck surface using a chain drag, physical testing of the UHPC–concrete bond strength, and microstructural analysis of the UHPC–concrete interface using scanning electron microscopy (SEM). Test locations were selected on both westbound and eastbound lanes, with and without potential delamination, and with and without deck grinding. The curb lines of the existing bridge deck were not diamond ground prior to overlay installation. The first step in the evaluation process was to identify regions of potential delamination along with a few regions where the bond between the UHPC overlay and substrate concrete appeared intact. Photographic evidence, like that depicted in figure 8, was gathered and synthesized prior to arriving onsite. Once onsite, the entire bridge deck was evaluated using a chain drag. Regions of potential delamination were marked on the surface of the deck and were recorded using a global positioning satellite-based mobile mapping unit. A total of eight potential delamination regions were found, of which two were selected for testing. Three regions exhibiting intact bond were also selected for testing. Table 3 lists the details of each test location. The interface bond strength between the existing concrete deck and the UHPC overlay material was assessed using the direct tension bond pull-off test method discussed previously and shown in figure 1. Select specimens, noted in table 3, were subject to microstructural analysis using a SEM. The goal of this analysis was to quantify the integrity of UHPC at the microstructural level. This analysis was conducted using a FEI Quanta 650 SEM equipped with a concentric backscatter detector. Large backscatter electron mapping areas were collected using AZtec 2.4 energy dispersive spectroscopy (EDS) microanalysis software. The interface was mapped in consecutive 10-mm wide bands (shown in figure 11), starting from the location were the UHPC cement paste contacted the concrete deck substrate. This analysis was conducted 10 times, moving backwards into the bulk of the UHPC paste (100-mm away from the interface line). This process was previously used by Beushausen, Höhlig, and Talotti (2017) to characterize the microstructure of bonded concrete overlays and is currently being used by researchers at TFHRC to characterize bond between fresh cementitious materials and existing concretes. (11) This analysis provided a quantitative measure of the porosity, aggre-gate, hydration products, and unhydrated cement particle content near the interface. Table 3. Test location details. **As determined by photographic evidence. Figure 12 presents the peak tensile stresses captured during direct tension pull-off testing at the five different test locations. This graph reports the minimum and maximum stresses recorded along with the failure mode exhibited by each specimen group. 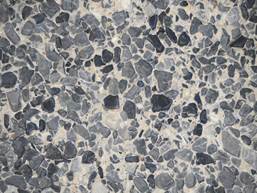 The results indicated a good bond between the UHPC overlay and the substrate concrete deck with and without diamond grinding. The peak tensile stresses sustained by specimens in regions G1, G2, and G3 prior to failure were comparable to, if not higher than, the bond strengths of other UHPC-class materials (nonthixotropic) bonded to a roughened concrete substrate. (12) Furthermore, the peak tensile stresses sustained by these specimens were, in most cases, higher than those exhibited by conventional grout-like materials bonded to a roughened concrete substrate. (6) For the locations with potential delamination (B1 and B7), pull-off test specimens failed in the substrate concrete at relatively low stresses. Some specimens tested at these locations did not hold any load at all. Instead, these specimens could be removed from their core locations by hand, indicating existing damage in the substrate concrete layer. †Concrete deck at this location was not diamond ground prior to overlay installation. 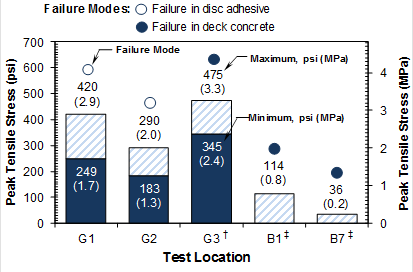 ‡ Minimum peak stresses were zero at these locations; damaged deck concrete was present. Figure 12. Peak stresses recorded from direct tension bond testing. Once testing was completed, the tested core samples were removed from their respective test locations. In some cases, specimens failed in the adhesive layer between the test disc and the UHPC overlay. These removed samples were first inspected visually, and then, select samples were subject to microstructural analysis. 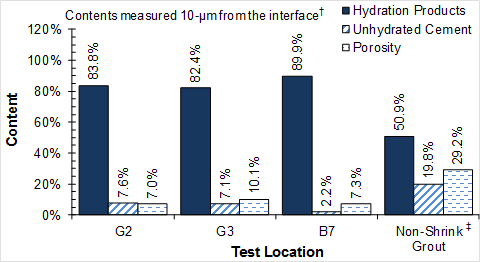 Figure 13 shows representative images of samples from the G2 and B7 test locations. Samples from other test locations appeared similar to those shown in figure 13. In all cases, the bond between the UHPC overlay and the substrate concrete appeared intact based on visual inspection. It was evident that failure of specimens from regions B1 and B7 was a result of preexisting concrete deck delamination. An example of preexisting damage in the concrete deck can be observed in figure 14. Preexisting damage caused specimens to carry little to no tensile load prior to failure. It should be noted that other regions of potential delamination (B2–B6, and B8) were not tested, and findings from tests completed at locations B1 and B7 may not extrapolate to these locations. Figure 13. Representative images from specimens at test locations G2 and B7. Figure 15. SEM micrograph from a sample taken from test location B7. †Aggregate content is not shown but was between 0 and 2.0 percent in each case. ‡Data from an on-going study at TFHRC– Grout A, control condition, bonded to an exposed aggregate surface. Figure 16. Representative results from microstructural analysis near the UHPC-concrete interface line. UHPC has mechanical and durability properties that make it a well-suited candidate for concrete bridge deck overlays. This TechNote highlights some of the recent work being conducted by researchers at FHWA TFHRC to better understand UHPC-class bridge deck overlays. This work included a laboratory investigation on tensile bond strength and a field study and subsequent laboratory investigation of a U.S. bridge that was recently repaired using a specially formulated UHPC overlay. The laboratory investigation described in this report resulted in comparable, if not better, bond performance of UHPC overlays compared to that of LMC overlays, making it possible to think about the potential use of UHPC overlays in bridge decks. It can also be concluded that the type of substrate material influences the bond strength, as the UHPC substrate exhibited higher bond strengths than concrete substrates. Likewise, the substrate surface preparation method seems to be important to obtaining good bond. The substrate surfaces treated with hydrodemolition resulted in higher bond strengths than those obtained on a scarified substrate surface. The first U.S. deployment of UHPC as a bridge deck overlay was completed in May 2016 on a reinforced concrete slab bridge located in Brandon, Iowa (Buchanan County). A few months after installing the UHPC overlay, a field inspection of the bridge concluded that isolated delaminations might be present in the deck. Thus, there was a need to assess the bond between the UHPC overlay and substrate concrete. In November 2016, a field study was conducted to evaluate the bond between the UHPC overlay and the substrate concrete bridge deck. Based on the observations and data collected during that field study, it can be concluded that bond between the UHPC overlay and the existing concrete bridge deck was intact. Mechanical testing verified that the locations suspected of having good UHPC–concrete bond were able to carry relatively high tensile stresses without bond failure. It can also be concluded that good bond was achieved even at locations where deck concrete was not roughened prior to placement of the UHPC overlay; however, this is dependent on the surface quality of the substrate concrete and is not a recommended practice. The two test locations suspected of delamination were indeed found to have delaminated concrete. However, delamination was preexisting within the deck concrete and was likely present prior to placement of the UHPC overlay. 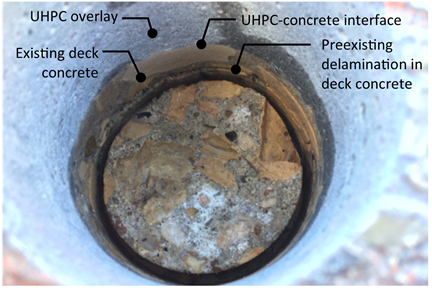 Visual inspection of the UHPC field specimens’ interface indicated, in all cases, that the interface between the UHPC overlay and deck concrete appeared intact. This was further investigated through microstructural analysis using a scanning electron microscope. Microstructural analysis revealed that there was a high density of UHPC in direct contact with the concrete substrate surface. This high density was caused by the high content of hydration products from the UHPC and low porosity adjacent to the interface. The consequence of this was a high degree of direct contact between the UHPC and the concrete surface, which translated into high tensile strength of the interface. Brühwiler, E., and Denarié, E. (2013). “Rehabilitation and Strengthening of Concrete Structures Using Ultra-High Performance Fibre Reinforced Concrete,” Structural Engineering International, 23(4), pp. 450–457, International Association for Bridge and Structural Engineering, Zurich, Switzerland. Haber, Z., Munoz, J., and Graybeal, B. (2017). Field Testing of an Ultra-High Performance Concrete Overlay, Report No. FHWA-HRT-17-096, p. 57, Federal Highway Administration, Washington, DC. Wille, K., and Boisvert-Cotulio, C. (2013). Development of Non-Proprietary Ultra-High Performance Concrete for Use in the Highway Bridge Sector, Report No. FHWA-HRT-13-100, p. 59, Federal Highway Administration, Washington, DC. Graybeal, B.A. (2014). Design and Construction of Field-Cast UHPC Connections, Report No. FHWA-HRT-14-084, p. 36, Federal Highway Administration, Washington, DC. Krauss, P., Lawler, J., and Steiner, K. (2009). Guidelines for Selection of Bridge Deck Overlays, Sealers, and Treatments, NCHRP Project 20-07 Report, p. 51, Transportation Research Board, Washington, DC. De La Varga, I., Haber, Z., and Graybeal, B. (2017). Bond of Field-Cast Grouts to Precast Concrete Elements, Report No. FHWA-HRT-16-081, p. 19, Federal Highway Administration, Washington, DC. Brühwiler, E., et al. (2015). Strengthening the Chillon viaducts deck slabs with reinforced UHPFRC, Proceedings of the 2015 IABSE Conference, Geneva, Switzerland, p. 8, International Association for Bridge and Structural Engineering, Zurich, Switzerland. ASTM C1583/C1583M-13. (2013). Standard Test Method for Tensile Strength of Concrete Surfaces and the Bond Strength or Tensile Strength of Concrete Repair and Overlay Materials by Direct Tension (Pull-off Method), ASTM International, West Conshohocken, PA.
ICRI Committee 310. (2013). Selecting and Specifying Concrete Surface Preparation for Sealers, Coatings, Polymer Overlays, and Concrete Repair, International Concrete Repair Institute, Rosemont, IL. Buchanan, P.M. (2002). Shrinkage of Latex Modified and Microsilica Concrete Overlay Mixtures, Ph.D. Dissertation, Virginia Polytechnic Institute and State University. Beushausen, H., Höhlig, B., and Talotti, M. (2017). “The Influence of Substrate Moisture Preparation on Bond Strength of Concrete Overlays and the Microstructure of the OTZ,” Cement and Concrete Research, 92, pp. 84–91, Elsevier, Amsterdam, Netherlands. Haber, Z., and Graybeal, B. (2016). Performance of Different UHPC-Class Materials in Prefabricated Bridge Deck Connections, Proceedings of the First International Interactive Symposium on Ultra-High Performance Concrete, Des Moines, IA, p. 10. Oxford Instruments. (2013). AZtec User Manual, 2.1, pp. 505, Oxford Instruments. Researchers—This document was prepared under the direction of Benjamin Graybeal at the Federal Highway Administration (FHWA) Turner-Fairbank Highway Research Center. The document content was prepared by Jose F. Munoz and Igor De la Varga of SES Group and Associates, LLC under laboratory support contract DTFH61-13-D-00007. Work was also completed under laboratory support contract DTFH61-16-D-00033. For additional information, contact Ben Graybeal at (202) 493-3122, Zach Haber at (202) 493-3469, or at the FHWA Office of Infrastructure Research and Development, 6300 Georgetown Pike, McLean, VA 22101-2296. Key Words—Overlay, bridge deck, rehabilitation, bond, cracking, deterioration, UHPC. Notice—This document is disseminated under the sponsorship of the U.S. Department of Transportation in the interest of information exchange. The U.S. Government assumes no liability for the use of the information contained in this document. The U.S. Government does not endorse products or manufacturers. Trademarks or manufacturers’ names appear in this document only because they are considered essential to the objective of the document.